What are domain names? How does a business register a domain name? What are the key elements to remember whilst registering? How does a domain name affect SEO? 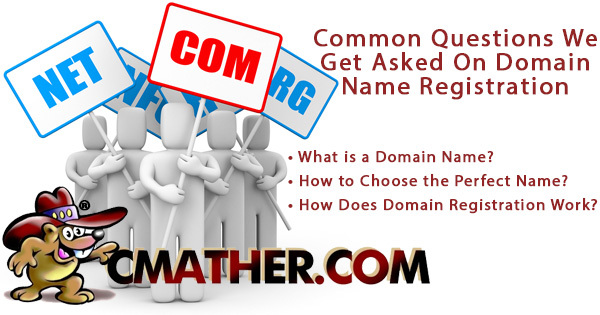 For answers to common questions regarding domain names and registration such as these, we have created this post to answer some of the common requests we get. Every website needs to have an address, and this is typically stored as a series of numbers. These numbers (IP address) point towards the exact place where your website is located. For instance, the numerical address for our website is 27.121.65.19. But people cannot be expected to remember numbers; hence the need for Domain Name System or domain name (as it is commonly called). Thanks to the DNS, it is possible to assign a word to every numerical address. A domain name has two or more words (also called labels) that are separated by dots. These words are arranged in a hierarchy beginning from the right and ending with a specific host name in the left. Consider our domain name www.CMather.com. The label .com is a top level domain, whereas CMather is a second level domain name. Sub domains can also be developed within this domain name. For instance, kate.CMather.com or www.CMather.com/maintenance is the examples of sub domains. Information about domain names is stored in a database by DNS Servers. All DNS Servers follow a hierarchy that begins with the root DNS server and ends with the DNS server of your Internet Service Provider.
.(country code) – Assigned to a country, for instance, .com.au for Australian Commercial sites. When you enter the domain name, www.CMather.com, your browser follows a set pattern to locate the site. The domain name and IP address are searched on your Internet Service Provider’s DNS server. If the domain name does not exist here, another DNS Server is contacted. The first server to be searched is the root server. Every TLD server stores information about a sub domain server. It answers the query with the IP address of the domain name’s server. The website then appears to you. Your ISP’s DNS server caches up this information for a certain time to help to retrieve it for subsequent requests. If after searching for some time, the DNS Server is unable to locate the information, an error message is displayed to the user. This is done multiple times until the domain name is located. It’s important to choose a good domain name, but more about that later. This is how the registration process works. To register the chosen domain name, choose a domain name registrar or web hosting company and type in your choice to test availability. If the name is already chosen, try different extensions like org, country specific top level domain, etc. And if the name is available, you can book it without actually choosing a web plan. This is called domain parking and is done to prevent others from grabbing it. You can even register more than one domain for the same website. Many web host service providers offer free domain name registration when you rent space from them. But cheap isn’t always best. Sometimes domain name registration companies may alter and modify your website’s DNS numbers. A problem with DNS numbers would possibly render your site un-findable. How to Choose a Good Domain Name Registrar? A domain name is your identity in the virtual world. Naturally, it should reflect you or the nature of your business. Ideally, choosing a domain name should be easy- just choose a clever combination of words and proceed to register, isn’t it? You wish everything in life was that easy! Don’t confuse a user with odd spellings – Just to make your web identity look snazzy you don’t have to deliberately use odd spellings. This confuses users and makes it difficult for them to remember your website name. Also, domain names are not case sensitive. When you enter a domain name, the browser converts all of these characters into lower cases. Thus, www.CMather.com and www.cmather.com would lead to the same website. Companies such as us prefer name arrangements to make our website name more readable or to emphasise a point. Don’t hyphenate – Hyphens should not be used for the same reason as odd spellings should be avoided. They confuse the user and are difficult to remember. Sometimes, a single hyphen makes sense, but more than one are a strict no unless you want your site to be categorised as a spam site. .com is preferred over other TLDs – Here again, the idea is to make it easy for the user to remember. When a .com TLD isn’t available, it makes sense to tweak your domain name a little or opt for another popular TLD. But don’t opt for an unusual TLD. For instance, if you are an ecommerce site and .com isn’t available, do not settle for ecommercesite .biz or ecommerce .org (this TLD is now available for commercial use as well). Users tend to remember .com more than other TLDs and are more likely to key in .com which could take them to your competitor. Names that don’t relate to your business name – Sometimes when the most obvious domain names have been picked up, people tend to prefer a domain name that’s not really related to their business name. For instance, CMather Web Development is our official business name and www.CMather.com is our domain name. www.bendigowebhosting.com wouldn’t make sense, would it? If the preferred domain name is already taken, try tweaking it with an extra word. But the best way to avoid this is to register your domain name as soon as you think about a business name. Exact Match Keywords: Would it help to rank better if keywords were used in a domain name? Ideally, it should because it is the job of a search engine to deliver information that’s relevant to the keyword phrase entered by a user. Exact Match Domains or EMDs were very popular until Google came up with the EMD Update. Thus, if your aim was to rank for the keyword Bendigo Web Development Company, you could purchase the domain name bendigowebdevelopment.com. But the EMD Update ensured that rankings for EMD sites with questionable quality went down. Does this mean that EMDs do not work? No, the idea is to avoid giving excess attention to keywords when choosing a domain name. Quality sites with keywords in their domain name are not likely to be affected. Domain Names Influence CTR: Domain names that contain a keyword have a better CTR or Click Through Rate. But does this mean that we buy a premium keyword domain for a CTR campaign? A lot depends on factors such as search volume, the cost of the keyword, the TLD choice, etc. Brand-able Keywords: The emphasis is now on branding your website. The more people discuss about your brand on social media, the more they share information about you, better are your chances of ranking high. Now think again, would people find it easy to share bendigowebdevelopment.com or another shorter version of this brand? Choose a domain name that people can relate to. As earlier discussed, you can always book a domain name to use it later. Domain parking is done by celebrities and popular companies to avoid people from misusing their name. But registering does not activate a website automatically; to do so you will have to rent web space. Companies such as CMather offer free domain parking where you can park your name. Free web space available with an ISP can be used to create another domain name. For instance, free web space on www.CMather.com can be used to host another site. But here you do not have the freedom to use an independent domain name and will have to tag along with the existing URL. The resultant site would look something like www.CMather.com / blog/some-site which neither looks appealing nor trendy. The problem can be solved by buying a separate domain name and pointing it towards the existing domain name. To do this, you will have to book a domain name with domain forwarding as an additional service. The web host can also be asked to mask the original URL so that users do not know about the change. This is often done by popular websites to include typos. At CMather we offer free Domain forwarding for all domain purchases. Easily redirect domain traffic to an existing site including email forwarding. In conclusion, domain name management can be a complicated process, however there are many tools offered by domain registrars such as CMather Web Development to help with your domain management. Please check out the reference links below for further information regarding these services we offer online. If you have further questions or support requests regarding this content, please contact our 24/7 support team. Why Buy a Domain Name is a free PDF document written by CMather to help business with domain name registration. Direct Link to Register, Manage and Transfer Domain Names.